We're often asked how it could be that small cap CRE prices trail by so much the robust appreciation of institutional assets over the last couple of years. We suggest that the answer lies generally with a disparate supply of capital, but we can also say that some small cap CRE markets have nevertheless performed quite well, thank you. Institutional prices, here defined by the RCA CPPI - Core Commercial Index that tracks principal commercial (non-multifamily) transactions above $2.5 million, have increased a heady 29.2% over the last three years and, as of April data, hover 11.9% above the previous 2007 peak level. By contrast, Boxwood's national Small Commercial Price Index (SCPI) for transactions under $5 million rose by only 13.4%, or less than half the rate of the large-cap CRE domain during the same three years, and remains 5.2% below the previous apex. We think this disparity chiefly lies with the wave of global equity capital that washed ashore seeking not only safe harbor from more volatile foreign markets but also the opportunity for strong capital appreciation. As prices for trophy properties slowly began to percolate in 2010 and eventually reached a boil with double-digit annualized gains for 30 consecutive months during 2013-2015, this stellar price appreciation attracted even more capital in perhaps a classic example of the price elasticity of supply. That price-supply dynamic isn't anywhere near as powerful in the small cap CRE world where assets primarily trade hands among local and regional players whose money pockets also aren't as deep. But that doesn't mean that selected metro areas within the smaller domain are immune to price inflation. Indeed, some are standouts. 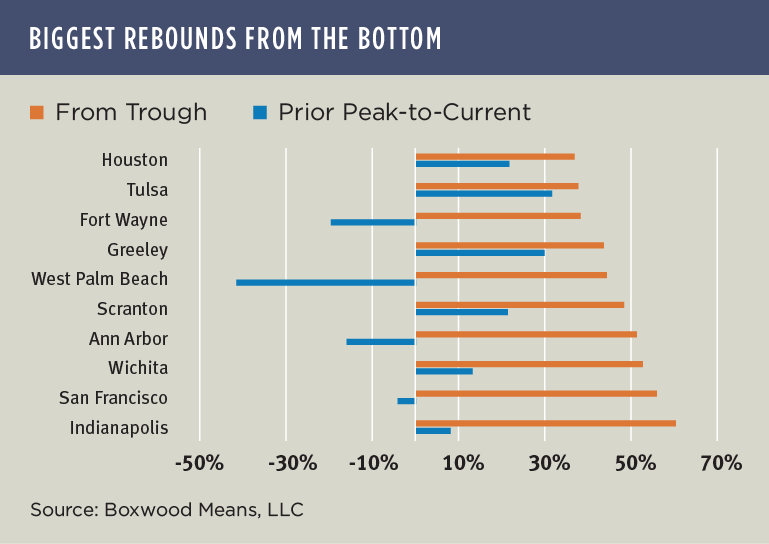 As shown in the nearby graph, peak-to-current prices in a number of oil and gas-related markets (Houston, Tulsa, Scranton, Greeley), among others, have ballooned into positive territory while property values in other markets (West Palm Beach, Fort Wayne and San Francisco) have also soared though still below previous peak levels. The simple fact is that the underlying growth of these local economies is the primary driver behind the ramp up in small commercial property prices. And because of that, the varying asset price trajectories across and within large and small cap CRE domains underscore how important it is for lenders and investors to use suitable tools of the trade to underwrite and monitor collateral values during all phases of the real estate cycle.